As things currently stand, Krugman is undoubtedly right about bitcoin on both counts. Very few vendors accept bitcoin (estimates range from 10,000 to 20,000), and its value is volatile. Meanwhile, on the subject of the internet—on which he was undoubtedly wrong—Krugman responded that he was joking (the perfect get out-of-jail-free card), adding that he is an expert in economics, not in technology. I’m an expert in neither. But what I want to do here is imagine a not-too-distant future in which Krugman turns out to be profoundly wrong again. As one of a few people I know among a relatively wide network—many of whom are media professionals—who has actually gone to the trouble to do some reading about bitcoin, and to purchase some, I frequently find myself attempting to explain the basics to people who, in increasing numbers, have heard of bitcoin but remain essentially bewildered. “What is it?” they ask. So, let’s give the simple answer: bitcoin is a digital currency. Sure, restaurants, coffee shops, real-estate agents, and Richard Branson might accept it, but bitcoin, if it takes off, will likely be largely an internet currency. Sure, nobody knows who bitcoin’s pseudonymous creator, Satoshi Nakamoto (中本哲史), really is, though there have been some serious attempts to find out: see here, here, here, and here. But it isn’t particularly important who Nakamoto (a traditional Japanese surname) is. “He” may be one or more very smart individuals. What’s more important is that bitcoin operates outside any centralized system—chiefly financial services and central banks, both objects of increasing global disgust—and it has accrued a growing community of shared interest: see here and here. As was the case when the internet was a mystery to the vast majority of people in the early 1990s, the members of such forums are—along with, increasingly, venture-capital startups—collaboratively working to create platforms that will likely, in the not too distant future, make bitcoin accessible to the general public, just as Netscape did, when it morphed the internet into the worldwide web. Yes, bitcoin is “mined,” as in increasingly power-hungry computer power solves increasingly complex mathematical problems to create what the combative anti-establishment finance commentator Max Keiser has referred to as “precious numbers.” Yes, it’s decentralized and peer-to-peer, offering the same disruptive potential to financial services that we have already seen shake traditional industries such as music, cinema, and publishing, to name a few. Yes, it allows instant transfers of funds with next to no transfer fees. And, yes, it has some problems. But let’s dispel a few of them. If you’re worried about the risk associated with holding bitcoin, or with its evolution as a globally accepted medium of exchange and storage of value, you’re not alone. The internet bristles with caveats about the security of wallets, third-party exchange platforms, and so on—see here, and for a basic walkthrough on the subject of wallet security, here. But let’s imagine for a moment that there are a sufficient number of bright minds working on these issues to make them history before too long. In that case, I want to imagine that the velocity of acceptance that we’ve seen over the past year—and a correlative evolution in per-unit value maintained as increasing numbers of people want to acquire bitcoin, and an increasing number of vendors accept it—continues. It’s charts like the one above that have led to repeated warnings that bitcoin is subject to a “speculative mania.” But if it is a speculative mania, it’s a mania with startlingly few participants, unlike the housing market bubble that led to the global crisis of 2007-8, or even perhaps, as some argue the US stock market today. As few as 1 million people planet-wide are invested in bitcoin. If it is indeed a bubble, it is an early-phase bubble by the standards of any historical precedent we have to go by. Logically, a lot more people would have to pile into bitcoin, causing its value to exponentially rise, before we should be talking about bubbles. An explosion in value is possible. Because there are only probably around 11 million bitcoin in existence (an unknown percentage is permanently lost, mostly by people who bought them when they were worth next to nothing and who stored them insecurely), in the event of wide-scale adoption, it will not be possible for everyone to own one. By the year 2140, 21 million bitcoin will be in existence—and that’s it. No more. Putting this in perspective, if the world’s richest 10% wanted to own bitcoin at that point, they would only be able to own a third of a coin each—assuming an equitable spread of the digital currency, which of course will not be the case. In other words, very few people will ultimately own a bitcoin. But that isn’t a problem. One bitcoin goes back eight decimal places, and its basic unit of value is a satoshi. Eight decimal places means there are 100 million satoshi to a bitcoin. Were we to imagine a world in which Krugman is again wrong, and bitcoin has become not only widely adopted—we can shop on Amazon and eBay for it, fill up our gas tanks, buy flights, houses, cups of coffee, and pay as we go for media content (more on that later)—100 satoshi might equal a dollar (in which case, of course, one bitcoin would be worth a jaw-dropping $1 million). I’m not so much suggesting that this will happen as, in such a turn of events, the basic unit of exchange would logically become the satoshi. Buying a cup of coffee for 200 satoshi is something that makes much more sense to the average consumer than 0.00000200 BTC (the commonly accepted bitcoin acronym). Meanwhile, the satoshi could also be the breakthrough that the internet has been waiting for since the world began surfing and buying online. The mainstream media have done little to educate the general public about bitcoin, largely focusing on “gold-rush” and “tulip-bubble boom” memes, or simply the plain “zaniness” of the phenomenon—this New York Times op-ed piece is typical of the caveat-emptor litany of fear-mongering about digital currency in the press and broadcast media. The FT concluded—as many other media outlets have done—that volatility and an “extraordinarily powerful set of interest groups” (governments and central banks) are the enemy of bitcoin as a medium of exchange. There’s no denying this, but the irony is that the media is in a position to be one of the major beneficiaries of a micro-payment system that bypasses PayPal and credit cards. The Financial Times is behind a pay-wall. For the online edition, it charges $8.99 a week. The New York Times charges $8.75 a week for “all digital access.” The Economist charges $250 a year. The Daily Telegraph charges £9.99 per week. The iPad version of The Guardian is available from £6.99 per week. Meanwhile, The New Yorker charges a more reasonable $59.99 annually. And so the list goes on. I actually do subscribe to the digital editions of a couple of these publications, but the idea that I would subscribe to all the publications I dip into in the course of my reading is absurd. I would, however (as I suspect many other people would), be more than happy to pay in satoshi as I go, if the rates were reasonable—let’s pluck a number from the air and say 10 cents per article, or approximately 1,000 satoshi at current bitcoin rates. I might even be prepared to pay one or two hundred satoshi to post on Facebook or Twitter (and it might make me think twice about posting some of the sillier things I post). In a sense, this is a way of saying that the argument, at the end of the day, is not whether bitcoin stands a chance of supplanting the fiat currencies we currently do our business with, but does it become the most logical means of exchange on the internet? Could it even save publications that are facing plummeting readerships because readers are not going to subscribe to everything? But of course we’re not simply talking about newspapers and magazines here. We’re talking about readily monetizing a host of internet features that currently earn nothing simply because it’s so difficult to allow them to do so—these thoughts by a non-expert who’s taken the time to do some reading and some thinking, and pay a designer to come up with a symbol for the satoshi, for example. In conclusion, I’ll go out on a limb and made some predictions—I have far less to lose in terms of popular esteem than Nobel Prize winning Krugman, after all. By 2020, bitcoin will be “both a medium of exchange and a reasonably stable store of value.” It will be accepted by such a large number of vendors, both online and off, that its scarcity value will have primed its base value to far higher levels than is the case today. Because bitcoin per-unit values are so high, its fluctuations in value—assuming they’re not wild—will be of little significance to anyone other than large holders, who will constitute a very small fraction of the general population. The satoshi will be the basic unit of transaction. Despite efforts by governments and traditional financial services to choke wide adoption, bitcoin/satoshi, due to ease of use and infinitesimal transaction fees, will have destroyed PayPal and Western Union, and will have made significant inroads in dismantling traditional financial services’ stranglehold on payments and currency transfers. This mirrors advice given by the more intelligent bitcoin bulls. If, for whatever yet unseen reason, bitcoin crashes and fails, it will, as Krugman predicted of the internet, have been no more influential than the fax machine. Given the current rate of adoption, that seems unlikely, but if bitcoin succeeds, Krugman can always say he was joking about that too. 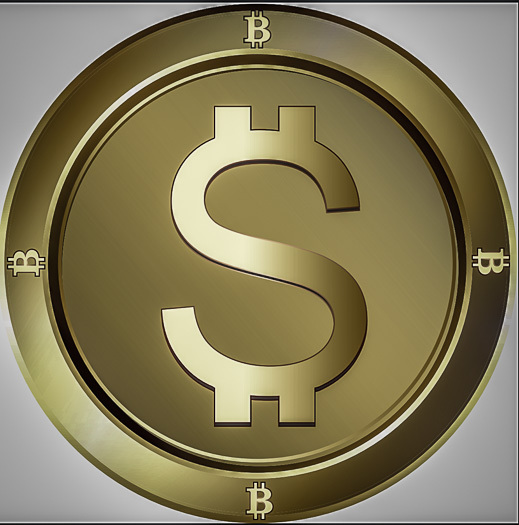 The Satoshi symbol was designed in collaboration with 99designs.